Artists, at least the kind of artists who cause outrage and bafflement when their work is exhibited in the Tate, have a similar problem. You want your work to glom onto something significant and say something about it that makes sense to yourself if to no one else, and you're allowed to do that with any material at all within the law and health and safety regulations: bits of tin, wire, plaster of Paris, marble, bronze, paint, canvas, neon tubes, dust bunnies, pickled shark... If you're very clever and /or lucky, you might hit on exactly the right expression for some feeling or situation or condition that no one has quite put their finger on before. Fame, fortune, and an angry editorial in the Daily Mail await. So there they are, social scientists and artists, looking about, antennae quivering, alert for the new. Might they sometimes help each other lock onto the same scent? The natural sciences have been prolific in practising not only this evaporation of things but also in reassembling innovative living entities, such as genetically modified organisms, and new creative possibilities are emerging with the advent of the enhancement of the human body with cybertechnologies. This fluidity of the living things is potentiated by interdisciplinary engagements, and entities which are in one minute the subjects of sciences become in the next the raw materials for arts. Forum Director Steve Yearley welcomed us to the event. Then one of the organisers, Maria Grade Godinho, introduced the session. She explained how she'd trained and worked as a biologist. Encountering genes with patents had brought home to her that what she did in the lab was part of a wider social world, which she wanted to investigate further. Here, she wanted to explore the possibility that the relationship between objects and data wasn't one between matter and mind, but between two different states of matter -- hence the metaphor of evaporation. Maria's co-organiser Chris Speed of the College of Art kicked off with a clip of the Challenger disaster, with its familiar voice-over of a man reading from the space shuttle's instruments and continuing to relay numbers for several seconds after the rest of America had watched the craft explode live on television. That shocked moment of delayed realisation when someone tapped the announcer's shoulder and pointed to the TV screen was, Chris said, what this symposium was about. He gave other examples: the debris of the later space shuttle crash, Columbia, tagged, connected by strips of tape, and spread across across a floor as a physical database; the flash crash of May 6 2010, as two duelling algorithms dumped stocks in a death spiral only interrupted by physically pulling the plugs; and one of his students' art projects, which consisted of a thick stack of A4, a printout of reports from her iPhone for one day. The presentations that followed were intriguing, varied, and of high quality. Mike Phillips took us from the melting Wicked Witch to the unease-inducing ambiguities of how scientific imaging converts numbers to visuals. Synthetic biologist Vincent Danos took us ever deeper into the molecular structure of starch and the phenomenology of mathematical modelling. 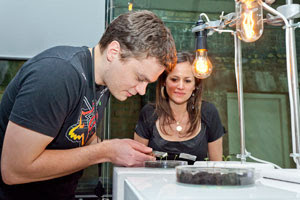 Laura Beloff charmed and delighted with her sci-art projects, starting with a portable 'space station for fruit flies'. Sociologist Gill Haddow walked us through how 'human' became in some contexts legally defined in terms of percentages of DNA. After and over drinks in the early evening, the exhibiting artists displayed and discussed their work. 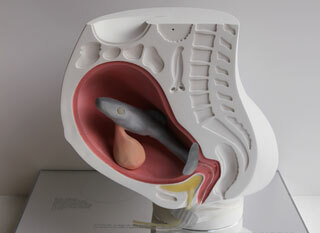 I wouldn't presume to judge or compare -- take a look for yourself -- but for me by far the most memorable and disturbing of their artefacts was Ai Hasegawa's short film of a woman giving birth to a salmon, which she later eats. Sushi will never be the same. So was the symposium a success? Did the artists, scientists, and sociologists combine their particular points of view to outline, somewhere in the room, an elephant we'd have otherwise missed? I think they did. The evaporation of things is a thing.